How does advocacy campaign innovation happen? I was recently invited to speak at the Frank Gathering on public interest communications put together by folks at the U of Florida College of Journalism and Communications. Aside from the chance to share the stage with some great speakers like Upworthy founder Eli Pariser, my talk on “Campaign Innovation in the Digital Age” gave me a chance to process some of the research and experiences we’ve gleaned at NetChange on how campaign innovation happens. The highlights are that innovative campaigns most often learn from the best practices of past campaigns that stood out for their policy wins, ability to scale or both. When we get these best practices down as a solid model (or framework) and make that more widely accessible, innovation happens more quickly across social change sectors and that’s a good thing for all of us. For my keynote I dove into two case studies — the Support. Don’t Punish. global drug campaign and the Stop Adani climate campaign in Australia. We know both cases intimately as we have worked with their teams over the past year. Want to sit back and watch the 10 minute spiel on video? Here you go. And for those who prefer to read, here are my thoughts on how campaign innovation happens in black and white. The Support. Don’t Punish! campaign, run by the team at the International Drug Policy Consortium, is a remarkable innovation case study. That a small team of 5 based in London put together a distributed campaign that now sparks days of action in 206 cities across the world is already impressive. That this team was not a bunch of dyed-in-the-wool campaigners or cracker-jack consultants makes it even more so. How did they get there? Careful observation of the Robin Hood Tax Campaign, which successfully used a distributed approach to spread a movement to reform the finance sector across the U.K.
Their innovation method in a nutshell: Reverse-engineering by looking at a successful campaign, figuring out what made it work and then deploying it into the world. Not nearly as easy as it sounds! The second story that comes to mind is the Australian Stop Adani campaign, which is fighting to halt construction of the world’s largest new coal project. 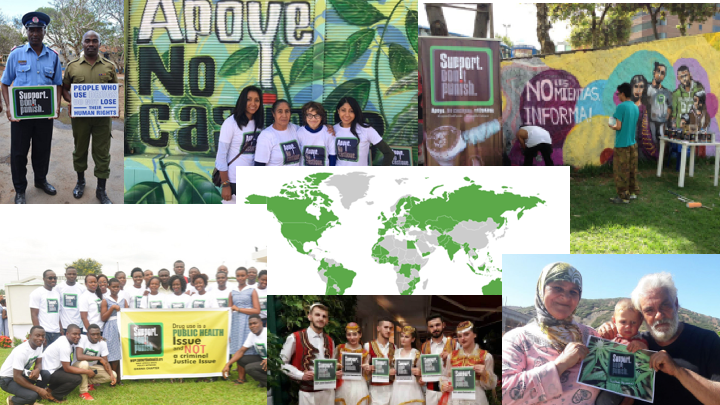 Though this campaign was years in the making, its most recent organizing phase was informed by the principles of the directed-network campaigning model we surfaced in our 2016 Networked Change Report (which mapped the strategies and tactics common to over 50 of the most successful advocacy campaigns at the time). Rolling on a framework built on best practices of many campaigns before them, the Stop Adani campaign has made great strides towards shifting the power balance against the mine this past year alone. Their innovation method in a nutshell: Forward-engineering of a campaign based on a model distilled from best practices of several prior successful campaigns. Not necessarily a cakewalk but a lot easier than reverse engineering. So what can we extract from these two stories? Well, both designed and planned their campaigns on a model based on the successful practices of innovators who had tried and tested their strategies in the field. When these best practice models had already been written up and could be drawn upon, as in the Stop Adani case, innovative campaign design and deployment was easier to manage. At NetChange, we believe that if we find and share frameworks for campaign innovation, we can help progressive advocacy campaigns evolve faster and build more power. This is why we have made our reports, both the 2016 Networked Change global and the 2017 Networked Change in Canada reports free for download and have followed that up with a free Campaign Planning Tool as well. Our desire to spread innovation as far and wide as possible has also led us to support the emergence of the Blueprints for Change project, which I tease out in my talk as well. Launching in a few weeks, we invite you to join our pre-launch list to get early access to the strategic how-to guides being prepared. Originally published at netchange.co on April 3, 2018.